Gosh, time flies when you’re entertained by political giants Julia and Tony doing their ‘I’m gunna rip your throat out’ routine and other pathetic attempts at boosting their terminally low polls. Now Tony flips seamlessly from rottweiler to statesman-in-waiting and the punters are again treated as mugs. Speaking of punters, add in doses of Barangaroo buffoonery from Junior Packer about his proposed casino and ever-smiling Tom Watercloset making football like horse racing. And you see why national affairs have been beyond ridicule and satire. So for a few months KC staff has been taking a well-earned and unannounced sabbatical. Oh, and by the way, our sustained campaign against the Australian war in Afghanistan has finally cut through with the PM acknowledging our contribution to shedding light on this misguided adventure. Not! But check for yourself by reading KC analysis over several years and you’ll see that the futility of Australia’s intervention and sacrifice is finally coming home to roost as we head for the Afghanistan exit already clogged with our allies. If you’re sceptical about history repeating itself, read William Dalrymple’s new book. During the break we did some serious cocooning (remember that voguish term of yore) in the Kookynie family home, and spent time smelling the desert peas. 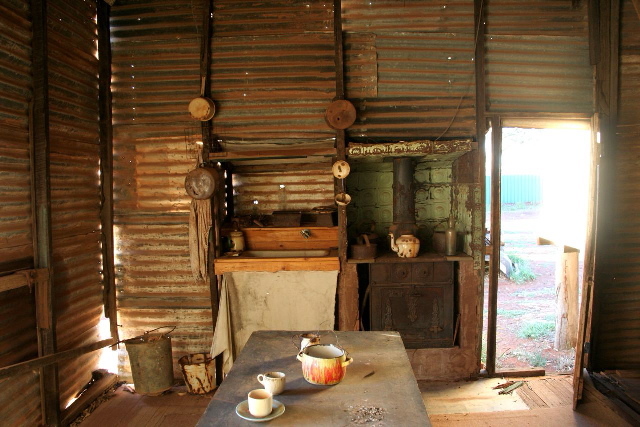 After an overdose of TV renos programs we decided to indulge in a modest and sustainable kitchen make-over. Made from 100% recyclable materials and architect-free, it’s already the envy of Kookynie’s other three residents, which of course is the whole point. Anyway, enjoy, whatever, like…..you know! Like the kitchen, colour scheme so tendance!!!! Plenty of air there, no need for extraction fan.